I have been visiting Tsaa (pronounced Cha) since I discovered it apartment hunting. A very well lit cafe style makes it very welcomeing. Promoteing the consumption of glutten free and vegan treats, they also offer coffee, bubble tea, teaware, teas etc. 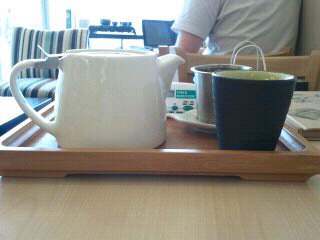 They are very versitile and cary a vass aray of tea ware. From chawans for Japanese tea ceremony to yixings for gong fu ceremony right down to the tea pot I got to use with this weeks tea. I apologize that I only have one image as this review is from notes I have sitting around waiting to be posted. I ordered a whole pot of this tea for the afternoon. Hidden is a glass pitcher in which I was given he first infusion and the second was steeping in the pot. The first sip was creamy and warmed my stomach thoroughly. The brew was very consistent. The second infusion had cooled a little by the time I was able to enjoy it (Japanese homework keeps me quite busy). It had a lighter taste and was sweeter than the tea while it was hot. Drinking tea in this manner is quite relaxing although I felt as though I should have made more infusions with the leaves. Though by the time the second infusion was done I was itching to paint that afternoon. My tea art is a result of that. I perhaps will revisit this tea again sometime in the future and compare many Milk Oolongs together. I am still formulating notes so this may take some time and research on the process for Milk Oolongs themselves.